Born in 1938, Alain Mérieux holds a PhD in Pharmacy. He served as an intern in the hospitals of Lyon and attended the PMD at Harvard Business School. In 1963, he founded bioMérieux, an in vitro diagnostics company, and was Chairman of this company until 2010. From 1968 to 1994, Alain Mérieux was Chairman and CEO of Institut Mérieux, the world leader in the fields of human and animal vaccines. From 1986 to 1998, he served as First Vice President of the Rhône-Alpes Regional Assembly, where he was in charge of International Relations, Economic Development, Research and Higher Education. Alain Mérieux is Chairman of the Mérieux family holding company, which took the historic name of Institut Merieux in December 2009. Institut Mérieux comprises three international bioindustrial companies in the field of healthcare: bioMérieux (in vitro diagnostics), Transgene (immunotherapies for cancer and infectious diseases) and Mérieux NutriSciences (food & environment safety and nutrition), as well as two entities devoted to innovation – the contract manufacturing and clinical research organization, ABL (Advanced Bioscience Laboratories), and the investment company, Mérieux Développement (specialized in the healthcare sector). Today, Institut Mérieux has close to 17,000 employees worldwide in more than 40 countries. 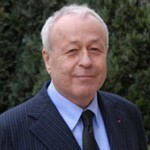 Alain Mérieux is President of Fondation Mérieux, established by his father in 1967, and of Fondation Christophe et Rodolphe Mérieux, which he created with his wife in 2001, under the aegis of the Institut de France. These two independent family foundations are dedicated to the fight against infectious diseases in developing countries. Alain Mérieux was decorated as Grand Officier de la Légion d’honneur in France and holds numerous international honors.